Miami University’s new crowdfunding platform, HawksNest — which we wrote about last week — offers an excellent opportunity for Miami students, faculty, and staff to seek funding for projects that might be difficult to fund through traditional channels. However, it’s important for prospective project owners to recognize that managing a successful crowdfunding campaign is quite different from developing a traditional proposal. 1. Tell a compelling story. Most people make spending decisions based on feelings, not thoughts. They choose to spend money on things that make them feel good about themselves, so you need to tell the story of your project in a way that shows prospective donors what they will get from supporting your project. Try reframing your perspective so that you do not think of your crowdfunding campaign as asking for money, but rather as offering self-satisfaction. You’re offering donors a chance to feel good about themselves by helping to make a discovery that could lead to a cure, or to solve a longstanding mystery, or to challenge unhelpful assumptions. And of course you’re offering them a chance to help students learn and achieve. Describe your project using friendly, easily accessible language that is suitable for non-experts. Describe your project in a way that helps prospective donors visualize the result or outcome. Select a photo that is visually interesting and supports your project narrative. If you do this well, visitors to your campaign page will perceive the quality of your project as high, and will feel confident supporting it with a donation. One thing to note is that projects that are culturally relevant to a specific geographic region are more likely to be fully funded. So, if your project fits in that category and you have a strong personal network in the relevant region (see #3 below), then play that up in your project description. For example, if you are from South Carolina and leverage your network of personal contacts from home, you could have strong success with a project that seeks to document and preserve the Gullah language native to the South Carolina and Georgia Lowcountry. It’s also important to remember that your story doesn’t end once your project posts to HawksNest. Continue to post updates — on HawksNest and your social media accounts (see #3 below) — during and after the campaign. Your visible engagement helps prospective donors have confidence in the project and gives existing donors a feel-good rush (which makes them more likely to donate again). 2. Choose the right campaign length and goal. Of course, you should always ask for what you actually need, both in terms of money and in terms of time, but within that context it’s helpful to know that more is not necessarily better. While HawksNest allows project owners to set a funding goal of up to $6000 and a campaign duration of up to 45 days, statistically speaking, projects that fall at the higher end of the range on either count are less likely to experience success. Data from other crowdfunding sites suggest that the sweet spot is a funding goal of about $3000 and a campaign duration of about 30 days. 3. Leverage your personal network. People you don’t know personally are more likely to support your project if they see other people supporting it. This is the concept behind baristas’ “salting” their tip jars with a few dollar bills at the beginning of the day. With crowdfunding, the way you salt the tip jar is by getting people you know to donate to your project first. Large social media networks correlate to greater success for crowdfunding campaigns, so post often to Facebook, Twitter, Instagram, and Snapchat. Also be sure to ask people in your network to share your posts with their networks, because outside links to a crowdfunding campaign also increase the likelihood of success. 4. Take advantage of the first few days of the campaign. Statistics from other crowdfunding sites show that raising 30% of your funding goal in the first week of a campaign translates to an 80% chance of meeting your goal. If you raise just 5% of your goal in the first week, though, the likelihood of meeting your goal drops to 50%. 5. Continue to promote your project for the duration of the campaign. 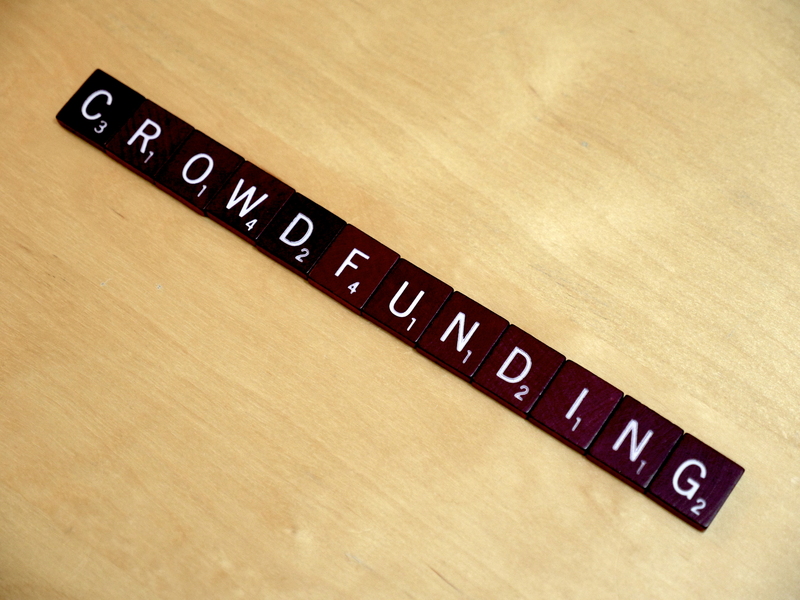 Crowdfunding is not a wind-it-up-and-let-it-go sort of thing. It requires constant engagement from project owners. This is all the more true for HawksNest, which doesn’t have as much traffic as, say, Kickstarter or Indiegogo. Post often to social media and your campaign page and send follow-up emails. Consider doing an Ask Me Anything (AMA) on Reddit or sending press releases to local media (see #1 above about geographically specific cultural projects) — anything to both let people know about your campaign and keep it front-of-mind. Written by Heather Beattey Johnston, Associate Director & Information Coordinator, Office for the Advancement of Research & Scholarship, Miami University. Crowdfunding Scrabble photo by LendingMemo.com via Flickr, used under Creative Commons license. Crowd photo by Scott Kissell, University Communications & Marketing, Miami University. This entry was posted in Finding funding and tagged crowdfunding, extramural funding, funding opportunities. Bookmark the permalink.